Classes typically begin with warm-ups, stance work, breathing exercises, and several drills to improve conditioning. The curriculum for beginner students emphasizes fundamental techniques through the development of a strong foundation (firm stances and powerful strikes) through the practice of stance exercises and Kiu Sau, a dynamic tension exercise. The goal is to build muscular development, improve flexibility, and to understand body connection (the coordinated movements of body and energy). As students progress, certain classes will be devoted to learning and practicing the traditional forms of Hung Ga, which incorporate hard (external) and soft (internal) techniques. 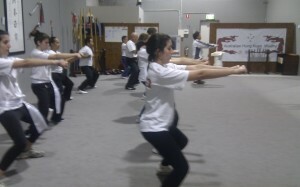 Other classes will focus on more advanced techniques, with emphasis on real-world self defense applications. The student will learn both long and short range techniques to apply to sparring situations eventually moving on to more advanced techniques involving grappling, locking, and throwing. As in most Chinese martial arts, there is also training in classical weaponry for more advanced students including broad sword, staff, butterfly knives, kwando, and umbrella. Hung Ga offers the potential for unlimited physical and mental growth. 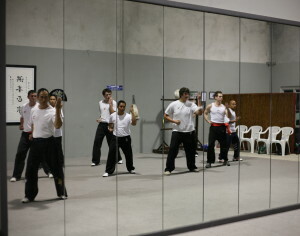 With persistence and consistency in training, a student can improve overall health through improved circulation and breathing, as well as increased muscle tone and strength The necessities of mental concentration and meditation components in Hung Ga training reduce stress and fatigue while sharpening mental focus. Students who work to their potential will enjoy the benefits of increased physical strength, increased energy, and improved mental clarity. Uniform is the club T shirt and black track suit pants or black martial arts pants.